The WI Walks made it! 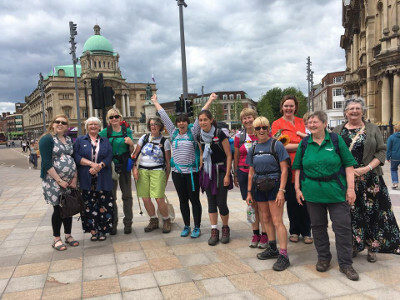 The WI Walks have been doing an amazing challenge over the last week and a bit, walking 185 miles in support of the Saving Denman Appeal. I do not know where to begin with my many thank you’s, there are so many from the WI members who walked with us, gave us a bed, fed us, washed our clothes, made packed lunches, bought blister plasters, to everyone who has donated. Thank you, thank you & thank you. I want to express how immensely proud I am to be a member of the WI. We are members of an amazing organisation full of friendship which has been shown across the country from Liverpool to Hull this week. We could not have done it without the friendship we have been shown over the past 9 days. I have made new friends of all different ages from different parts of the country, I don’t think there is any other organisation that would allow me to do that. Along the 185 miles we were so proud to inspire & encourage other women to join a WI near them, we spoke to so many women that I’ve lost count! Again thank you to all who have cheered us in more ways than one. Be PROUD to be WI member! So many congratulations to all involved!